Making their debut at The Work Truck Show were several new vehicles and enhancements to the line of Ford Class 1-7 commercial vehicles. Included were the new medium-duty F-600 Super Duty chassis cab as well as updates to F-650 and F-750 trucks, E-Series and F-53 and F-59 stripped chassis and Transit models. Also introduced was a new engine, added connectivity and driver-assist technologies. 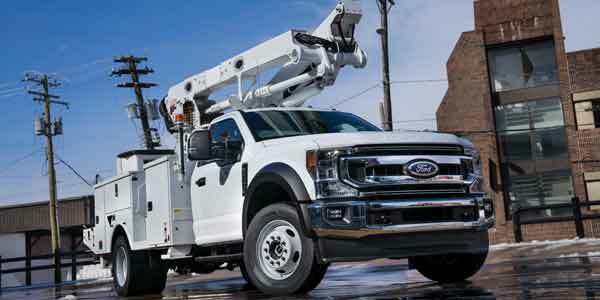 The Ford F-600 Super Duty chassis cab, according to the OEM, fills the gap between F-550 and F-650 models for operations that need additional payload capacity or have the need to mount heavier equipment. 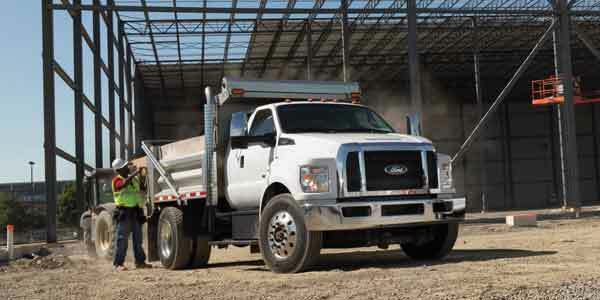 The F-600, with the same overall size as an F-550, has a maximum GVWR of 22,000 lbs. To help achieve the higher rating, the new model is fitted with upgraded driveline and chassis components, as well as higher-weight-rated 19.5-in. tires and wheels. F-600 chassis cabs will be available in mid-2020 with a choice of gasoline or diesel engines and with 4×2 or 4×4 drivetrains. Ford’s new 7.3-liter V8 gasoline engine, which was introduced earlier this year in F-Series Super Duty pickups, is also available in Super Duty chassis cabs, as well as F-650 and F-750 medium-duty trucks, E-Series and F-53 and F-59 stripped chassis. The engine replaces the manufacturer’s 6.8-liter V10. In Class 6 and 7 medium-duty trucks, Ford offers both the new 7.3-liter gas engine and a 6.7-liter Power Stroke V8 diesel. Features of the new 7.3-liter V8, Ford noted, include a compact package that provides better access for technicians. The engine has a new cam-in-block, overhead-valve architecture with a cast iron block and a forged steel crankshaft, as well as port injection with variable-valve timing and oil jets that cool pistons under heavy loads. Both Ford engines are mated to the OEM’s six-speed TorqShift automatic transmission. In addition, a 10-speed TorqShift automatic is available with a live-drive power takeoff provision rated up to 300 lb./ft. of torque. New from Ford for its F-53 and F-59 stripped chassis commonly used on walk-in vans and motor homes are higher GVWR models up to 14,500 lbs. E-Series cutaway and stripped chassis models used for shuttle buses, ambulances and small RVs, are being updated for 2021 as well. Included are two unique engine horsepower and torque calibrations for the 7.3-liter V8, and a new upfitter interface module for installed equipment. Upgrades to Ford Transit models for 2020 include two new engines mated to a standard 10-speed transmission and available all-wheel drive. In addition to cargo and passenger van, chassis cab and cutaway models, a new Transit crew van with seating for five joins the lineup, and three-across front seating is also available. Exterior updates include an available power sliding door for cargo and passenger vans. All Ford commercial vehicles are now standard with 4G LTE WiFi for up to ten devices. New Ford Telematics and Ford Data Services are available across the lineup. The telematics systems can be integrated with existing service providers or provide data directly into IT systems. Smart driver-assist technologies on all Ford commercial vehicles include automatic emergency braking, which is standard on 2020 Transit and 2019 Transit Connect models and available across the rest of the OEM’s lineup. Additional elements of Ford Co-Pilot360 driver assist technologies that are standard on F-150 trucks are also set to become available on the manufacturer’s commercial vehicles. For F-650 and F-750 medium duty trucks, and E-Series and F-53 and F-59 stripped chassis, traction control, hill start assist and auto headlamps are standard. Options include adaptive cruise control, electronic stability control, lane departure warning, a Driver Alert System and auto high-beam headlamps. 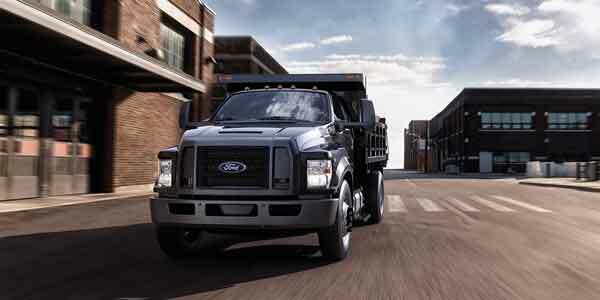 On Super Duty chassis cabs auto high-beam headlamps are standard and lane departure warning is available as an option. 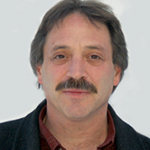 The latest updates to the entire Ford commercial vehicle lineup complete the refreshing of medium-duty trucks, Super Duty chassis cabs, E-Series and stripped chassis and Transit models that began 13 months ago, noted Mark Buzzell, Ford’s director of fleet, lease and remarketing operations. “The updates were driven by our customers’ focus on improving safety, reducing cost, and increasing uptime and productivity,” he said.